Naignouma Coulibaly is the rebounding queen in NF1 basketball this season with an average of 16.9 per game. She also leads the scoring with 18.5 points and has an efficiency rating of 23.4 points. Coulibaly is just 20 years old and became an immediate attraction for US Colleges after her performance at the African Youth Championships. She rose quickly within the Malian basketball system and was a member of the senior squad at AfroBasket 2007 and the Olympic games of 2008. Her ambition of becoming a professional basketball player came fast with the promotion of Basket Landes into the LFB for the 2008-2009 season. They offered her a professional contract. 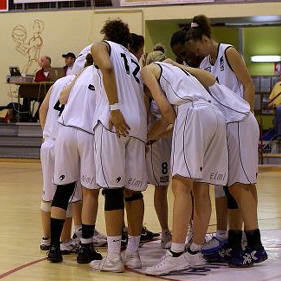 She joined up with the team after the Olympic games and made her début during Basket and the City 4 in Paris. Unfortunately her dream was short lived as her playing licence was revoked for medical reasons which resulted in her missing a number of games. By the time she was allowed to play again, Basket Landes were fighting for survival in the LFB. So they came to an agreement to end her contract during the Christmas break. She also went to Poland but things did not work out for her. She was hoping to find something for the current season (2009-2010) but to her disappointment she received no offers from professional clubs. Coulibaly who left Pleyber-Christ to become a professional basketball player found herself going through a full circle when she returned to the club. Pleyber-Christ made space for her in the roster so that she could continue her basketball education. Naignouma Coulibaly played for 42 minutes, scored 27 points, collected 27 rebounds and drew 13 fouls for Pleyber-Christ against Illkirch-Graffenstaden and still ended up on the losing team. Pleyber-Christ also travelled without fire fighter Mélanie Vernier for the match. Otherwise the core roster remained intact. For the SIG Aline Fischbach returned after missing the last three games. The match itself was not a classic and a game that the SIG would want to forget in a hurry. The SIG had no answer for Coulibaly and they also got distracted from playing their own game by the physical nature of their opponents. The result was that the SIG had to play for 45 minutes, attempted too many shots from beyond the arc and almost lost a game that they should have put away. Both teams shot 32 times from beyond arc. Yet we had to wait until the fourth quarter for the teams to score regularly. The SIG were more conservative in their shot selection than their opponents, taking 20 shots less over the period of the game. Fischbach was the leading scorer for the SIG with 19 points. She went 5-of-11 from beyond the arc. Her team-mate Charline Servage was also handy from the three-point land with 3-of-6 in her 19 points. Pleyber-Christ on the other hand hit the target from beyond the arc on 8 occasions with school teacher Caroline Le Fé making 5-of-13 to finish the game on 17 points. In total the SIG fired in 13 three-pointers while Pleyber-Christhit 8. The first quarter was slow and ugly as neither side played appealing basketball. Coulibaly split a pair of free-throws for Pleyber-Christ to edge the first quarter (15-14). The second quarter was a little better with more shots going in. Coulibaly continued to draw fouls which resulted in the SIG having nobody to guard her for some time. The SIG put a good stretch together to open a 5-point lead. But they could not maintain the advantage and both teams went to the locker room tied (35-35). Pleyber-Christ's aggressive tactics appeared to be working as they countered the free-flowing basketball of the SIG to lead (53-52) going into the final quarter. Finally the SIG changed their approach and played more direct basketball, taking their opponents on before throwing the ball out for three-point scoring opportunities. Caroline Nestor-Deininger showed how to do it by hitting back to back three-pointers. Then the SIG went 10 points clear after 3 consecutive three-pointers by Fischbach (70-60). This was the moment that Pleyber-Christ went to their veterans and started to play the type of basketball that makes NF1 interesting. Céline Boubala-Yembi and Le Fé connected from the land of many. This was followed by baskets from Alexandra Thos and Coulibaly to bring the scores level (70-70). Servage decided it was her turn to hit a three-pointer as the SIG went into the lead once more. However with 50 seconds left to play Coulibaly was able to draw a foul while scoring. She hit the free-throw for what turned out to be last score of the quarter (73-73). Pleyber-Christ had the chance to win the game with Coulibaly and Le Fé both going to the free-throw line in the last 10 seconds of regulation time. Yet they missed. Overtime was very dull in comparison to the previous quarter. However Darline N’Soki, who had missed four free-throws in the game, found herself at the charity-stripes. She made no mistake and the SIG were on their way. Servage was everywhere and put the SIG 5 points clear with 49 seconds left to play. There was still time for drama when with about 10 seconds left Le Fé hit the shot of the match from way behind the three-point line. Then Pleyber-Christ quickly fouled Servage who split the pair from the charity stripes. Pleyber needed a three-pointer for the game to go into double overtime. Le Fé had the last shot but no miracles this time. As expected Charleville-Mézières beat Tours (TVL) at home (90-63) for victory number 16. This means they are the first team this season that cannot mathematically be relegated. Union Hainaut Basket-Saint-Amand had a difficult match against the CFBB and managed to win (82-72). The victory was mainly due to the energy of Laëtitia Kamba with 19 points and 11 rebounds. 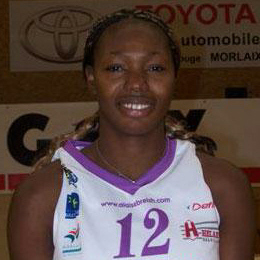 Mariame Dia's basketball achievements have been regular basketball news items in Dunkerque this season. So her 21 points, 15 rebounds and 4 assists in Dunkerque Malo's victory (80-71) against CSP Rezé should come as no surprise. Roche Vendée and Nice BC 06 made it a perfect weekend for the top six in the league as they also came away with victories. Roche Vendée required an act of "Harry Houdini" to pull off a road victory against Charnay-lès-Mâcon (72-67) while Nice BC O6 gave Voiron a heavy thumping (80-57). US Laveyron's struggles continue with a home defeat (51-68) against Reims while Rennes made it 4 wins in a row with a victory against Lyon BF (77-65).